The famous 8-wheelers of the Wehrmacht are one of the most fascinating topics for many modellers. Some years ago I bought the complete range of Roden's kits, from the Sdkfz 263, 231 over the 232 up to the Sd.Kfz 233 with the 7,5 cm KwK 37 L/24 gun. 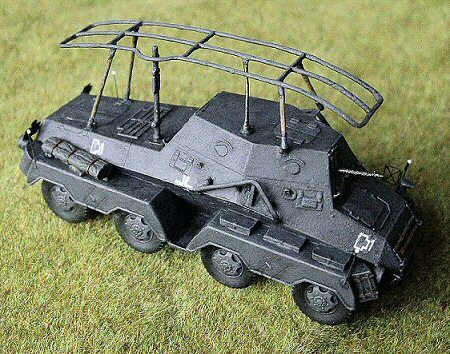 For a long time, these were the only plastic kits available in 1/72 scale and even nowadays they still can compete in many points to more modern releases as those from Dragon. Some details in the Roden kit are a little bit rough, like the thick number plates, the very simplified muffler covers etc. But luckily ExtraTECH produced some very nice PE upgrade sets for these vehicles. So, except for some (in my opinion) too flat parts for the aerial frame (here I only used the mounting brackets as base of the antenna supports) and some other details that don't really improve the kit, I added all the tiny eyelets around the raised superstructure, the nicely made mesh for the muffler covers, the more convincing PE number plates, tow hooks, width indicators, pennant holder etc. For the correct position of the fender bins and stowage I based myself on wartime photos of the original. 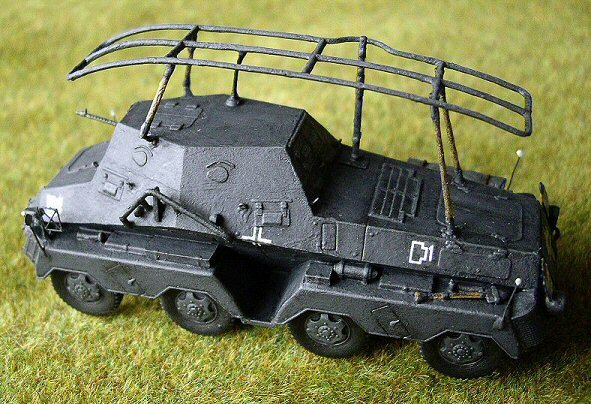 So I "borrowed" a second shovel from another kit, added a scratchbuilt tow rope to the front hooks, a resin tent roll and added a wire (made from thin plastic rod which normally is used to attach price tags to clothes) to the frame antenna to connect it to the superstructure. The decals came mainly from the Roden kit. Unfortunately these did not include the number plates. 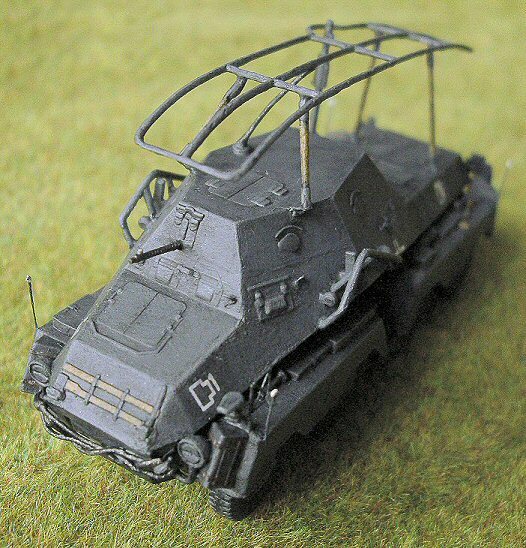 So I took them from another Roden kit, the Sd.Kfz 233 and also used a larger cross from an ICM kit for the backside of the vehicle, since many photos of original 8-wheelers show here a clearly different size compared to the smaller crosses on the sides. 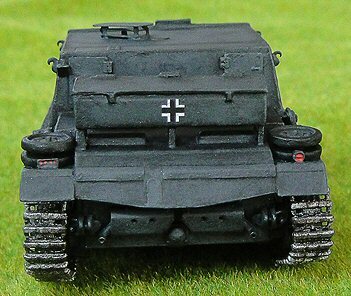 Painting was done in my favourite technique by drybrushing the model in Revell Tank Grey 78 on a base of black paint. 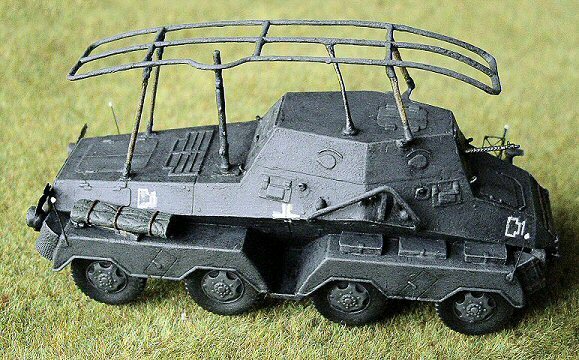 In the end I highlighted by drybrushing with Revell Stone Gray 77 and painted the details as rear lights, shovel handles and the wooden parts of the antenna supports and, not to forget, the very delicate moulded MG 34. Decals were attached by using Micro Sol. 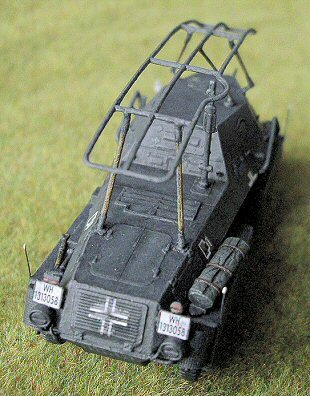 However, the cross on the grille on the vehicle's back was a difficult part. In the end, after applying the clear varnish, I waited until it started to soften the decal and then pushed it with a small flat screwdriver in the grooves as deep as possible.